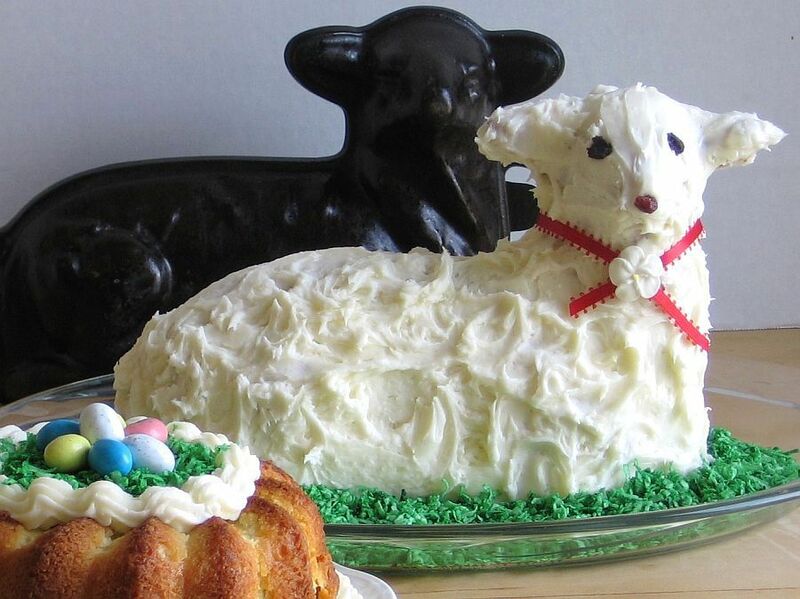 Easter lamb cake (known as agnuszek or baranek wielkanocny in Polish) is a traditional Eastern European dessert. In the 1950s, the trend for frugal cooks tired of paying exorbitant bakery prices was to purchase a cast-iron lamb mold to make it themselves. These molds are considered family treasures that are passed down at Easter time and through the years. Pound cake is the best candidate for a mold because of its close crumb. Scratch-made or purchased pound cake mixes both work fine. Extra batter can be used to make a little cake for the swieconka basket. Using a pastry brush, coat the interior surfaces of both halves of a seasoned lamb cake mold with solid vegetable shortening, making sure you get into all the crevices. Place halves on a baking sheet, open-side up, and heat for 20 minutes. Remove from the oven and let cool completely. Pour off any excess shortening. Reduce heat to 350 F.
Prepare pound cake mix according to box instructions. Place the front-half of the mold on a baking sheet and fill with batter to the lip, 1/4-inch from the top. Submerge a toothpick in the batter in each ear to reinforce them. Place the back-half of the mold on top of the front. Place in oven and bake about 1 hour or until a skewer inserted into the vent holes of the lamb come out clean. Remove from oven and place on cooling rack for 15 minutes. Carefully remove the back end of the mold, inserting a knife between the mold edges if they are stuck together. Allow cooling for an additional 5 minutes. Place another rack on the lamb cake and carefully flip it over and remove the front half of the mold. Let lamb cake cool completely lying on its back. Place a dab of cream cheese frosting on an oblong platter and set the lamb on top to secure it. Frost all sides of lamb, swirling it to represent lamb's wool. Wrap a narrow red ribbon around the lamb's neck. Use raisins for eyes and nose, cutting them in half if necessary to make them more proportional. Place coconut and green food coloring in a zip-top back and shake it, to color the coconut. Place green "grass" around the lamb. Serve for Easter and enjoy!